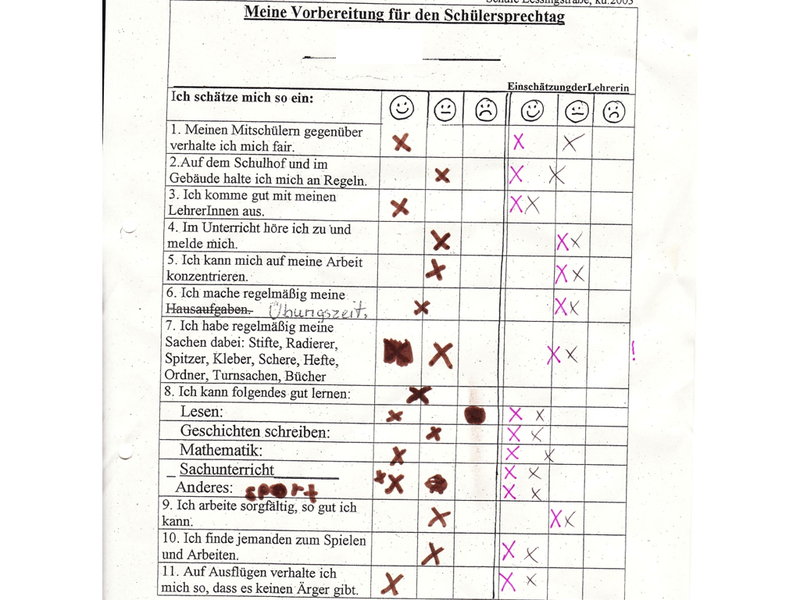 Yesterday I published a self evaluation template, used by young children in a German school. It was interesting, I thought both in terms of the approach to formative evaluation – evaluation for learning rather than of learning – and in terms of the use of self evaluation as a tool for discussion between students and teachers. A number of people commented that they did not understand German and furthermore, because the file was uploaded as an image, they were unable to use online translation software. Pekka Kamarainen noticed the queries on Twitter and kindly provided me with an English translation, reproduced above. I have written many times about Assessment for Learning and the self assessment or evaluation of learning. Assessment for Learning is the idea of formative assessment to support the learning process, rather than most of our present assessment systems which are designed to support comparisons or as a screening mechanism for entry into higher education or education and training or into employment. And self evaluation – it is what it says. The idea that learners are able to evaluate or assess tehir own learning, often with a surprising degree of insight and accuracy. Of course when they do this they own the assessment – it ceases ot be something that is done ot them but is part of their own reflective learning process. But, say teachers, this is hard to do. Learners will not know how to do it. they will over-rate their own abilities. So practical examples are always welcome and I was lucky enough to see today the self evaluation of one of my friend’s children in a school in Bremen (reproduced above). The process went something like this. 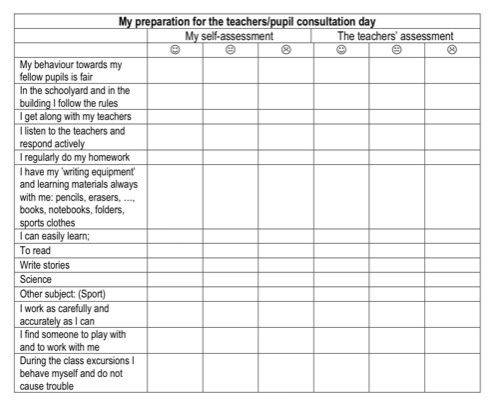 Last week the students – aged 8 – were asked to fill in their own assessments in the left had column. Then the sheets were passed to their two form teachers who also filled in the assessment in the right hand column. And then today there were individual meetings between teachers and the students to discuss the results. (It is interesting to note that like in previous expercises of this sort that I have seen, teachers tended to rate students slightly higher than the students themselves). Seems pretty cool to me (even if a little overly emphasising behaviour and conformity) and much, much more useful than the UK Standard Assessment tests (SATs). The main aim of the TACCLE project was to help teachers improve their use of technology for e-learning, and to do this they created a handbook. In addition they provided courses to guide teachers in technological programmes that although simple once understood can be very difficult initially. The launch for the handbook was held in Ghent, Belgium along with a day of workshops, which around 200 teachers and trainee teachers attended. Here is some feedback from the day. Video and blog post by Jo Turner-Attwell. It is Open Access Week and here at Pontydysgu we are committed to doing our bit to support the cause. We have a large archive of papers and books to which one or another of us has contributed at some time or other. None of it is going to be a best seller but some of the papers and books may be of interest to researchers, teachers, trainers or developers. And form time to time, I receive an email from people asking about where they can get a copy of one paper or another. We did have a go at it a year and a half or so ago and Dirk spent ages trying to get the system working using bibtext. The problem is the system was just too clunky. Indeed looking at our stub page of journal articles I see the server is feeding up the following error message – Failed to write file/home/pontydysgu.org/htdocs/wp-content/plugins/bib2html/data/pontydysgu.cached.bib – check directory permission according to your Web server privileges – whatever that means. So we need a better system. We did think about using the University of Bremen;s open access docuemnt service. But once more, on test this also has its drawbacks. This afternoon I tried creating an ebook on the Lulu site. And it is not bad. However all it basically does is makes available a PDF file, albeit with quite a neat presentation. So if any of you are interested you can download “Creating Learning Spaces: Training and Professional Development for Trainers” from the Pontydysgu page on Lulu (for free of course). I reckon this is not a bad format for books. And for papers we are thinking of using Scribd which seems to work pretty well with WordPress. But i would be interested in your views. What is the best way for us to publish an archive of perhaps 200 papers, books and book chapters? And what is the best format? Should we try to produce ebooks for devices like the ipod touch? And, if so, what is the best way to do it> Your help will be much appreciated. Invites to Google wave seem to be fast rippling out so time for some first thoughts. Like most people I guess, my first reaction was what is it and what can it do? The first problem is trying to find someone to play with. Wave is decidedly a collaborative environment and it is not easy to find open waves to join. I found an educators directory and added my name along with the 300 or so others there. But that didn’t seem particularly useful – why create a list of people just because they are in education and in possession of a precious wave invite. So I reverted to some old technology and twittered out. Pat Parslow invited me to join a ‘sandbox wave’ he had set up for people to introduce themselves and play. And play we did – to such a degree that it was decided to copy what was useful and sensible to yet another introductions wave. Don’t get me wrong, Google Wave is by no means finished. The interfaces can be clunky, it is not always easy to find where text has been added or edited or commented on, the replay doesn’t work – at least on my computer, and the people aspect of social networking seems a little rudimentary. The idea is to write the workbook together in one week and to publish it under a Creative Commons BY SA license on www.lulu.com with co-authorship to anyone who contributes. Shout (or should I say wave) if you are interested. I was going to – and still will – write a post celebrating Open Access Week. But it was somewhat ironic on the first day of the week to receive an evaluation report on a project we submitted under the so called valorisation strand of the Lifelong Learning Programme which focused on the use of social networking and social software to provide open access to the results of projects. But the feedback on this project was truly shocking. It was almost impossible to connect the feedback to the project – indeed I double checked the reference number in case they has sent the wrong review. So then the question is raised of why? And I think it is just because the reviewer does not get the idea of open access. In his or her view the job of a project is to assist the European Commission in managing ideas and project outputs – not to empower projects to develop their own networks. We said: “The dissemination & exploitation of programme and project results at European level are frequently designed in rather traditional models. The use of static content continues to be the main focus which in many cases reduces the impact that projects may have, both sectorally with user groups, but also with stakeholders & policy makers. This project will connect project leaders, partners & members of the European Commission with key networks & communities. The goal of Europe UNLOCK-Ed is to create an innovative & suitable framework for dissemination & exploitation of LLP project results through an Open Access to Knowledge approach. The project will develop an interactive framework using participatory media, supported by national training, online multimedia resources, an open Social Network Site (SNS) for online discussions and access to resources, synchronous online & face to face events & a handbook (electronic & hard copy) which will inspire a culture of open participation & sharing of knowledge. It aims to facilitate the development of adequate competencies & skills for LLP funded projects regarding the use of web 2.0 tools & raise awareness of Online Copyright & Intellectual Property Rights (IPR) which are issues which many projects struggle with. An e-guide on Online Copyright & IPR will also be developed & published on the project’s SNS for free distribution. The project will also provide an opportunity for existing projects to disseminate & exploit their own results through the open e-journal for the publication of European LLP project results which will be established. To summarise, this project is two-fold: it proposes to harness the latest web technologies to promote & develop effective techniques & methodologies for the transfer, dissemination & exploitation of results & it will also create learning opportunities as to capacity build & empower other projects to apply the same framework to their projects to ensure the greatest impact & sustainability. We said: Europe UNLOCK-Ed wants to create an open, interactive, user-generated online knowledge database on topics addressed by lifelong learning projects and programmes. A social network site linking key networks will be launched to promote peer participation & offer a diversity of learning opportunities through the use of multiple online environments & web 2.0 tools. An e-guide, related pedagogical training, multimedia resources including e-journal & online events will also derive from this approach. The SNS will be based on Open Source software and will include different areas for peer participation. The site will be open to all visitors and participants willing to engage actively, and will be able to register for a free account. The SNS will also feature group areas and allow interaction in different languages. Aim: To develop a hands-on training programme on the appropriate use of participatory media for dissemination & exploitation of project & programme results. A handbook on the use of participatory media for innovative dissemination and exploitation of programmes and project results will be a direct output of the development of the training course carried. The handbook will compile relevant information and practices covered in the training course in the partners’ country languages. It will be published on the project’s SNS for free download. The open e-Journal platform will be based on open-source software with advanced search facilities through the use of collaborative meta-tagging. It will be open to the wider community and feature international publications focusing on dissemination of results of European programmes and projects. When possible, the e-Journal will be featured in the Directory of Open Access Journals. It will also feature the LOCKSS box as to ensure the preservation of the e-Journal’s content in the long-term. A WP consisting in exploring the thematic of Online Copyright and Intellectual Property Rights with the help of an expert in this area. An e-guide summarizing the main points concerning this issues will be the main output of this WP. It will be released in the SNS for open access and free use and distribution under a Creative Commons Licence. A event focusing on the organization of a face to face event combining the celebration of the Open Access Day with the core purpose of the project. It will aim to encourage the effective use of participatory media for dissemination and exploitation of project results. The event seeks to promote the project, provide hands-on opportunities to learn about the use of web 2.0 , online copyright and IPR to create a culture of open knowledge and sharing at national level . We said: The project targets at the creation of a framework in the development of innovative strategies for the dissemination and exploitation of European project and programme supported by Erasmus, Leonardo and Grundtvig. It seeks to instigate an open, cooperative environment linking important network and communities together in an open forum for sharing of practice and co-construction of knowledge in relevant topics of different educational sectors. The project will benefit projects across 3 of the LLP sub-programmes and so will celebrate a diversity of projects, from a diverse range of cultural and linguistic backgrounds. Projects in countries other than those represented in the consortium partnership will be able to access the online resources offered by this project, regardless of cultural and linguistic background. We said: The project aims at building opportunities to engage and promote intercultural dialogue by linking key existing networks and communities together in an open forum for the dissemination and exploitation of lifelong learning projects and programme results. Project will target Erasmus, Leonardo & Gruntvig projects & will link key existing national agencies & international networks & communities in a shared dialogue focusing on practice & research of thematics relevant to the LLP. It will seek to bring different levels of expertise together by connecting younger researchers and practitioners with senior peers across fields. Diverse asynchronous and real-time interaction opportunities will be created for participants to share their projects. Projects built on networking strategy, to connect existing network & communities in an interactive open forum, where sharing practice & collaboration among projects will be enabled through social media. The project will make use of national agencies to link into existing projects offering them resources and training to give their projects a wider visibility especially at a policy level, ultimately supporting the achievement of wider impact and transference of project results on a larger scale. Yesterday I spoke at the Taccle project final confernce on the theme of the Future of e-learning. It is a big subject to deal with in twenty minutes and I hope that it at least was coherent. The audience were some 150 teachers – most from Belgium. My main themes were the need to develop open education and break down traditional subject barriers and institutional barriers to access to education plus the need to build on the new pedagogic approaches ot learning that social media and new technologies offer us. There was time for a few questions and they were hard. The first (one that I am frequently asked) was about motivation. Did I have any proof that such new approaches would motivate those students who are presently alienated by the schooling system. The answer is that I do not have any proof. We have ‘micro-examples’ of how technology and different pedagogies can inspire students who previously have not engaged with traditional tecahing and learning processes. But not on any large scale. A follow up question was as to whether any governmental, regional or even local districts have implemented my ideas. Again the answer I guess is no. We do not have large scale implementations of open education at present. And the third question, in a slightly different vein, was if I am right about the future what are we going to do with school buildings – mostly designed for the ‘factory model; of tecahing. And that also is a herd question – although I do think the many examples of factory buildings converted for use as enterprise centres or design centres offers a vision of what could be done, given sufficient money. The workshop mainly focused on the use of social software for learning, and coincided with the release of the excellent Taccle project handbook on the subject (will post link to PDF version in next couple of days). Many of the teachers had little – if any – experience in using technology for teaching and learning – but were keen to learn more. However, I wonder if we need to refine our approaches to training teachers. Whilst these events are useful, the common response is: “Yes I can see how good this approach is but how could I use it in my subject area.” Teachers tend to relate to other subject teachers as their community of practice. And it may be time that we moved beyond the more general how ot use a computer in tecahing ‘conciousness raising’ to looking precisely at how to use technology within different subject areas (yes – I know this runs at odds with my appeal to break down subject barriers). Of course the problem is that the research community knows little about this and they still tend to run many of the events. We now have a critical mass of teachers who are tech savvy and they should be taking the lead in such things. This also goes for projects. I am afraid to say that too many of the European funded projects seeking to introduce technology for learning are failing just because the project partners have little expereince in teaching themselves. An interesting event and thanks to all who helped organise it. “There are cultures that heavily depend on oral traditions for learning (the whole Orient, first nation people all over the world). It is still unclear how to deal with this difference, but it seems that the Western idea of libraries are not efficient for this. There is an article from South Africa describing that a certain disadvantage for African people is manifested even in the digital divide due to a focus on written information within library and e-learning systems. It is still unclear how to adapt Western e-learning concepts to this. This adds to differences in hierarchy and differences in the concept of teachers. Discourse approaches like in Western class rooms often fail because expectations towards the role of teachers are different. There is also comparative research investigating the different online behaviour of Norwegian, American, and Korean students. Norwegian students tend to be more discourse oriented than American students. If discourse is a main educative goal I would assume that this is mirrored in the e-learning environments used or in how e-learning environments are used. I will meet Eileen Leubcke next week to discuss designing a research project around these issues. If you are interested and have ideas around this, please get in touch. Just spent half an hour checking around blogs and twitter to see what is new on a Monday morning. And I was interested to see the latest survey from Pew Internet (just an aside – why cannot we organise as thorough a survey in Europe as Pew does for the US?). I will be coming back to many of these issues in the next few posts. But I am particularly interested in the issue of the division between personal and work time and between physical and virtual reality – although I am not sure about some of the terminology. two weeks ago we ran a workshop on Digital identities at the European Conference on Educational Research in Vienna as part of the Eduserve Rhizome project on Digital Identities. We are working on a short video on the workshop which should come out later this week. Most of the issues arising from the workshop were as we would have expected and in line with similar workshops we have organised in the UK. But what was surprising were some of the discussions in the workshop especially around the issues of privacy, personal spaces and work . personal life issues. Why surprising? Mainly because there was such a divergence of feelings around these issues. there were some 18 participants in the workshop from 15 different countries. And it appears that attitudes towards privacy and work / personal life divisions are heavily influenced by culture. This finding requires far more investigation than we were able to undertake in a short workshop. But it does appear that in different countries there are very different attitudes towards for instance what data should be private and the degree ot which entries on a social networking sites should be viewed as part of professional activities. One participant provided an example of where a teacher had expressed personal opinions on a social networking site which were seen as racist by parents of some of the students and resulted – if my memory is right – in them being dismissed. Some felt this was reasonable, given that such an opinions would effect their ability as a teacher. Others felt that however objectionable such opinions this infringed on rights of personal free speech in a non work related forum.